With every finger crossed, the US Open made its draw last night for the 50th anniversary edition of their New York tennis extravaganza. 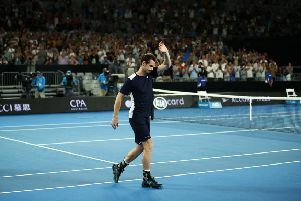 Hoping against hope that everyone – Andy Murray in particular – was fit and raring to go, the computer lurched into life and pitted the Scot against Juan Martin Del Potro in the third round. If ever there was to be a test of Murray’s recovery, taking on the gentle giant of Tandil would be it. But these days, in only his fifth tournament back in business following his hip surgery in January, a third round at a major championship would be a real achievement. He has not played a best-of-five set match since Wimbledon last year. To get as far as the Del Potro match, Murray will have to steer a path past James Duckworth in the first round and, potentially, Fernando Verdasco in the second. And in theory, Duckworth should present a very winnable match. The Australian was once ranked as high as No 82 in the world but over the past 18 months, he, too, has had his injury woes. Last year, he was only fit to play one match as he hobbled from surgery to surgery to try and clear an issue with his right foot and with his right shoulder. Life did not improve with the start of the new season and at the end of January, he had two more operations: one on that troublesome foot and another on his right elbow. Consequently, his ranking dropped out of the top 1,000. Now ploughing his way back up the pecking order, he is ranked No 445 and is facing the Scot for the first time in his career. It took Murray only three matches to bound up the rankings ladder from No 832 to No 375 as he reached the quarter-finals in Washington earlier this month. Alas, the effort – and the ludicrous scheduling – brought him to a standstill and finishing his third round match at 3am, he unsurprisingly pulled out of the competition to give his body a chance to recover. Since then, he has played and lost just once, against Lucas Pouille in the first round in Cincinnati. Yet the very fact that Murray was able to play three, gruelling, three-set matches (including a win over Kyle Edmund) was a huge step forward from the grass court season. Then, with only a couple of weeks of practice behind him, he played three matches, won one and realised on the eve of Wimbledon that he was not ready to contest a grand slam event and play best-of-five set matches. Should Murray pull rank on Duckworth, he will know exactly what to expect against Verdasco. The veteran Spaniard with the terrifying forehand is now 34 years old but is still making life difficult for those with their eyes on the silverware. Ranked No 31 in the world, he has won only one hard court match this summer, preferring to collect his points and dollars on the European clay courts following his first round defeat at Wimbledon. He and Murray have played 14 times in the past with Verdasco winning only once. Even then, it took five sets at the 2009 Australian Open when Murray was struggling with a virus. If Murray were in his pomp, the sensible money would be on him to ease into the third round next week; this summer, all bets are off. Reaching the quarter-finals in Washington proved that the Scot’s motivation and sheer, stubborn refusal to give in are still as sound as ever but at this stage in his comeback, his game still needs grooving and honing. But he is getting there. Still – first things first. Murray has to step on court to play his first match in New York and restart his grand slam career. He came close at Wimbledon; this time his followers will wait with baited breath until his opening match is called at Flushing Meadows.